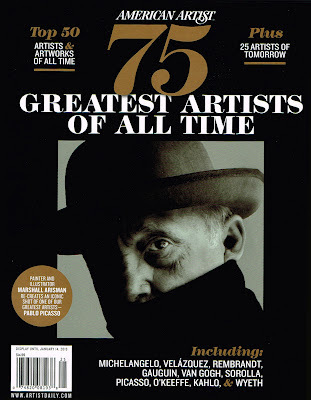 I am honored to be included in the American Artist 75 Greatest Artists Of All Time. I am humbled to be featured amongst talented artists David Kassan, Jeremy Lipking, Casey Braugh, Brad Kunkle, Sean Cheetham, Burton Silverman, Antonio Lopez, Richard Schmid, Jacob Collins, Lucian Freud, Rembrandt van Rijn,Caravaggio, Vincent Van Gogh, Pablo Picasso, Edward Hopper, Winslow Homer, Andrew Wyeth, Winslow Homer, Georgia O'Keefe, Frida Kahlo, and many more. Thank you American Artist Magazine and everyone for your support! In bookstores and newsstands the month of October. If you can't find it, click the image to purchase and download a digital version of the issue. 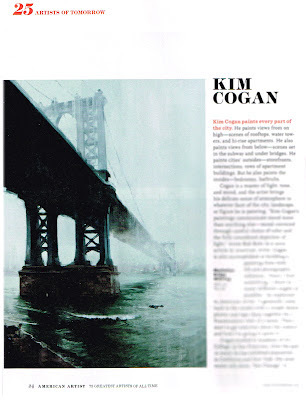 Sign up to receive news and updates from Kim Cogan.